My grandson Robbie goes to the Hillcrest School in Ocala and rides with Marion Therapeutic Riding Association’s (MTRA) horseback riding program at the school. He was a needy child lacking in self confidence until he began riding a horse in January 2012. He was a natural on the horse and began feeling good about himself. 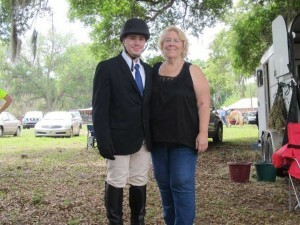 He qualified the 2012 Special Olympics Equestrian Area Games and qualified to compete at the State Games in Tampa, Florida. Robbie came home with two gold medals! Now he not only rides with MTRA but he is also a volunteer on Saturdays and any days that he has off from school. He recently competed at the 2014 Special Olympics and again came home with gold medals for his efforts. His talents continue to improve with every passing month. I have also been volunteering at MTRA. They have classes at Hillcrest School for Exceptional Children on Tuesday morning, for mostly wheelchair students, and on Thursday for ambulatory students. MTRA is in desperate need for dedicated strong men and women to assist in the riding program as side walkers (walk along the side of the horse) to help hold, support and assist the instructor with helping the rider to understand the tasks they are being asked to do. Several of these children are non-verbal but they do understand when spoken to. The children that ride on Thursdays also need side walkers.MTRA’s main facility, known as the Greenway site, is in rural Ocala between Baseline and 441, near the Sheriff’s substation. There are classes at the Greenway facility on Tuesday, Wednesday, Friday and Saturday that include children from the age of 4 up to folks in their 70s. These classes include riders with MS, Parkinsons, Cerebral Palsey, Autism, Down’s Syndrome, Prader Willi Syndrome, and numerous other challenges that seem to be easier to deal with just because of their ability to ride and be with our horses.MTRA depends on their volunteers and training is being provided for those willing to dedicate some of their time to this amazing program. They frequently hold Volunteer Workshops that focus on leading, sidewalking and mounting and dismounting of our clients. If you would like to become a very valuable part of MTRA, please call Karen Holmberg, Volunteer Coordinator at 352-732-7300. Volunteering at MTRA has helped me deal with the stress of dealing with the nurses at my Mom’s and other family stresses. Volunteering gives me time away from those stresses. I love the horses and seeing the smiles I helped put on the kids faces does me so much good.